In honor of the late wetsuit pioneer Jack O'Neill, droves of surfing community enthusiasts on Sunday paddled out into the Pacific Ocean near Santa Cruz to honor the legendary surfing icon. O'Neill died of natural causes on June 2 at the age of 94. To celebrate O'Neill's legacy and reminisce about his life accomplishments, scores of people crowded the rocks near Pleasure Point or dipped into the chilly water — clad in wetsuits, of course — for the remembrance event. A paddle out ceremony is a traditional practice carried out by surfers when one of their own dies. Surfers paddle out into the ocean, form a circle on the surface of the water and toss flowers into the sea. 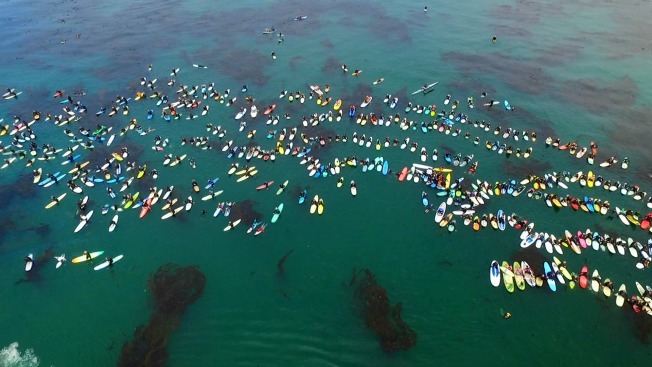 A sea of surfers on Sunday formed a massive circle — several people deep at some points — just offshore to honor O'Neill. 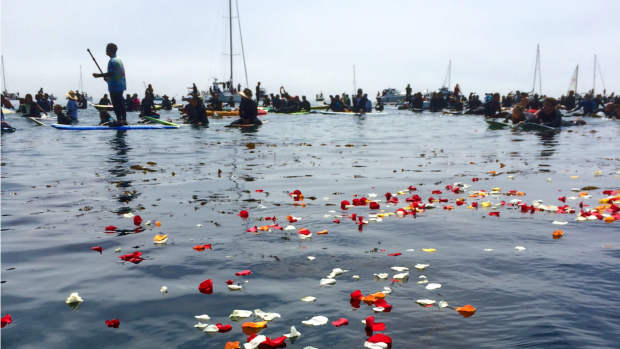 Colorful flower petals could be seen sprinkled across the water as people quietly paid their respects. O'Neill, who famously sported an eye-patch following a surfing injury, originally adventured to San Francisco in the early 1950s, but the frigid Pacific Ocean swells turned his attention to finding an article of clothing that could keep in the water longer. He toyed with various materials, eventually created the first neoprene wetsuit and opened his first shop in the city by the bay. In 1959, O'Neill moved to Santa Cruz and launched his second shop. Fast forward roughly 20 years and O'Neill had cemented himself as the world's largest recreation wetsuit designer and manufacturer. His surf brand was recognizable across the globe. Despite his prowess in the surfing industry, O'Neill considered his proudest achievement to be a marine and environmental education program for children. The O'Neill Sea Odyssey shuttled youngsters to the Monterey Bay National Marine Sanctuary to learn about the ocean.